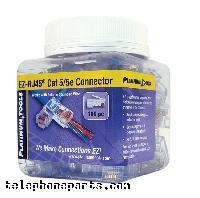 These strain reliefs are specifically designed for the EZ-RJ45 Cat5e connector. 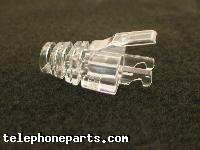 The unique design allows the strain relief to be crimped with the connector, making it an integral part of the assembly. Once terminated the strain relief WILL NOT pull off the connector. Electrical performance of the termination is optimized by maintaining the bend radius of the cable exiting the rear of the connector, per Category 5 requirements. Professional high quality appearance. Achieve the look of a commercially molded patch cord with a field termination! Note: Unless otherwise mentioned, these strain reliefs only work on the Cat6 plugs. Please note if you are using our shielded version PLT-100020 plug you will want to use PLT-105016 anti-snag strain relief. *Please note if you are using our shielded version PLT-100020 plug you will want to use PLT-105016 anti-snag strain relief. 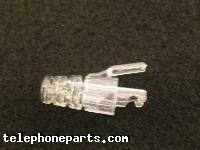 *Please note if you are using our shielded version PLT-100020 Cat5E plug, This is the strain relief that fits it.